What do you do when you don't have a lot of money. Well, you go to Target of course and you play with all of the toys! Just kidding. I had to pick up the angel picture of Kiya(see previous posting), so we thought we would stop by at Target. Gigi and I took the kids to Target to look around. 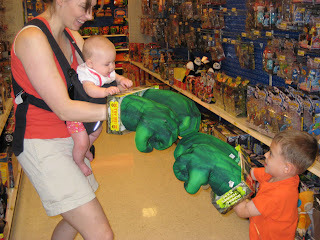 While there, Gigi pointed out these cool Incredible Hulk gloves. 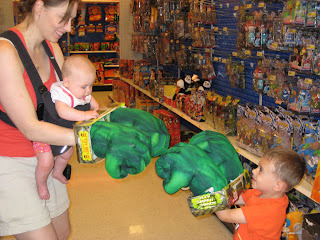 They made noises when you put them on and tried to punch. Caiden and I decided to try them on for size. 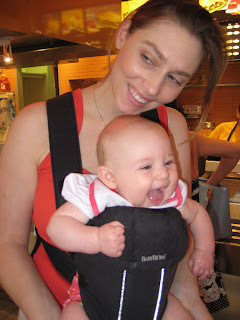 As you can see, Kiya even got in on the act! Sounds like fun. When David was little his uncle Steve worked at Toys R Us and he used to take the kids and let them play with the toys to see what they liked. Awwwwwwww. Kiya is so cute, she looks so happy in that last picture!! 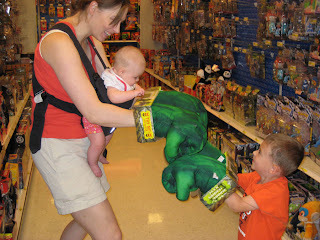 I love those Hulk gloves! They are sooo much fun! Kiya is the cutest! I can almost hear her laughing in that pic. I love that last picture of Kiya. She is so cute! kiya looks so happy in that picture. very cute.